Where did you get the idea for the website? How many requests do you get? Do you read them all? Do you make them all? What differences are there between free and paid song requests? Will you make me a song for free? How much can I expect to pay you for a custom song? May I please use your songs in the movie or other thing that I'm making? What equipment/instruments do you use? Do you make music that isn't from requests? Unable to find a job, I started posting eBay auctions where the winning bidder would receive a personalized song, written and recorded by me. It went surprisingly well, and several weeks in I launched this website and started making short, silly songs for free based on visitors' suggestions. The name "Songs To Wear Pants To" popped into my head randomly when I was 17. I used it for a CD that I put out in high school, and when I started this website it seemed like an even better fit for the name. I usually receive between 50 and 100 a day, and I read each one. Unfortunately because so many come in I don't have time to respond to each person, much less write and record each suggested idea. The 500+ songs on the site actually represent far less than 1% of all the suggestions that have come in. If you really need a song made please get in touch about commissioning me. What differences are there between free songs and commissions? I only make a song for free if I really like the idea and have a lot of spare time. Free songs are always posted on STWPT, and often paid songs are not. For the first three years of Songs To Wear Pants To, free songs never exceeded one minute and eleven seconds in length, partially to keep things short and sweet, and partially for the challenge. 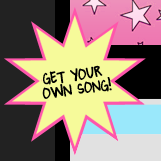 I try to keep the free songs entertaining for everyone who visits the site, so I won't make free personal theme songs, anniversary songs, birthday songs, film/animation scores and so on. These are the most common types of requests, and it wouldn't be fair for some people to get them for free when others have to pay for them. Also, this is a full-time job for me, and doing just the paid ones keeps me beyond busy. It depends a lot on your exact request, but you can expect something between $100 and $200 per minute of music. 1. All your content is rated G - suitable for audiences of any age. 2. Your work is not used in any commercial way. 3. "SONGSTOWEARPANTSTO.COM" is credited for the music, with a link if your work is displayed online. Go here for a pretty comprehensive list. All kinds! You can check out VS if you're into hip-hop, Your Heart for my rock/pop/folk jams, Girl and Ghostface Kilobyte for everything electronic, and my mixed-genre experiment The Cloud. "How old are you?" I was born in 1984. "How long have you had this website?" Since April 9, 2004. "How much money do you make?" It varies. I get by just fine though, don't you worry about me.